Nokia's next flagship smartphone "Nokia 9" is being speculated to host a penta-camera setup at the back, according to the leaked images surfacing in the media. The images suggest that the rear camera system hosts five lenses, an LED flash and an infrared radiation (IR) focusing apparatus. The roles of these five lenses would be telephoto, black white, colour and multi-lens pixel synthesis, The Next Web (TNW) reported late on Friday. The smartphone, internally codenamed "TA-1094," appears to sport the cameras in a flower-like pattern with one shooter in the centre, surrounded by the others along with an approval-seal from Zeiss. Zeiss has been a long-standing camera partner for Nokia phones and the company has also reportedly "applied for a patent on a miniaturised camera zoom system - which looks similar to the one in the leaked photo," the report added. 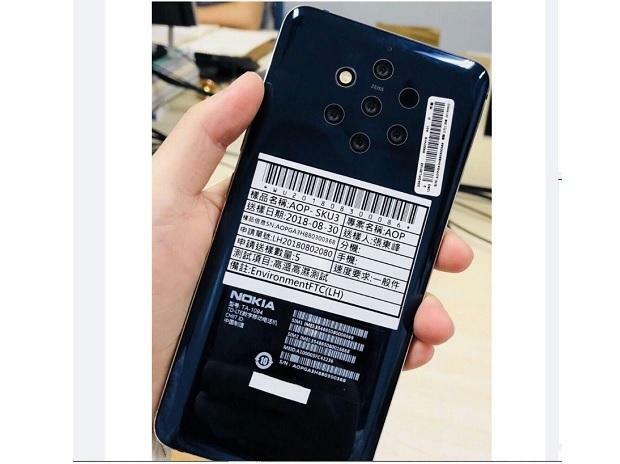 Previously, an image of the "Nokia 9" was shared by tech website Slashleaks which also showed a five-camera setup at the back of a blue-coloured smartphone. Dual-rear cameras have been a trending fashion in recent smartphones until Chinese electronics giant Huawei launched its "P20 Pro" smartphone earlier this year, featuring three secondary cameras. There has been no word from Nokia about the specifications or the launch date of its next flagship smartphone as yet.